This is an enjoyable story about the history of Australian bushrangers that will spark the interest of children aged 7 years and up. The story begins with a disengaged Tommy who has failed his history test; he is kept in over lunch to read a boring history book, and misses his chance to buy a special donut. When Tommy notices a boy eating his desired donut, he kicks him and steals the donut, then he runs away from school. His distressed parents announce he will spend the whole of his upcoming school holidays working on his grandparents’ farm. This is not how Tommy had planned on spending his holidays. Farm life is not as tough as he expects and he is provided with Combo, a horse, for the duration of his stay. The discovery of a cave and an old bushranger’s hat during one of his rides is the pivotal event that sends Tommy from the contemporary farm life into the life and times of Captain Thunderbolt, an Australian bushranger. 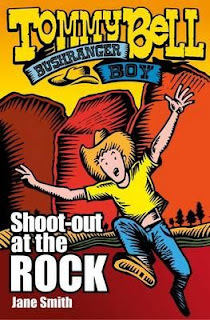 This section is fast-paced, as Tommy appears at moments such as a shooting between police and the bushrangers.Tommy’s first-hand experiences in Captain Thunderbolt’s world soon changes his attitude to stealing, violence; and history. This is the first of a series of books, where Tommy, with the help of the old hat, travels back to the world of the Australian bushrangers. Sprinkled with bold illustrations, and concluded with historic notes about Captain Thunderbolt, the story is followed by a fictional interview with Captain Thunderbolt.